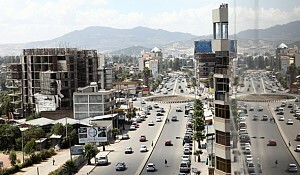 ADDIS ABABA - The number of population living in the urban areas has doubled within a decade. It has increased from 4.3 million (11% of the total population) in 1984 to 11.9 million in 2007, which represents 16.1% of the total population according to the 2007 population census. This figure is projected to rise to 18.3 million by 2017. The population in urban areas grows by an average of 4.3% which is almost twice faster than the growth rate of the total population in the urbanities (2.6 % p.a.). Apart from that, the government builds houses mainly for the low income earners. 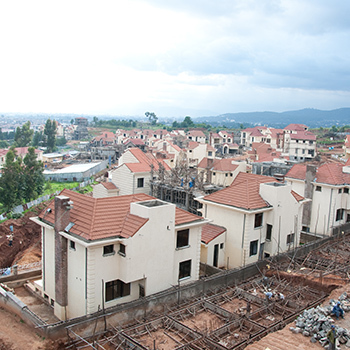 This has created a fertile ground for the private sector to engage in the construction of real estate development which is for middle and high income earners. "With increased income, construction in housing usually expands in a cyclic [spiral] way. Even in structural terms, when the employment structure of an economy gradually changes from a rural economy into an urban economy, the possibilities of the business in housing are unlimited. 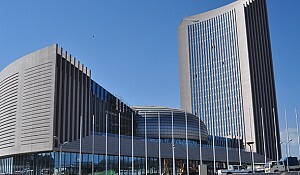 In that sense, we have always tuned our construction business to focus on buildings and actually we have become well-known throughout the country as well as abroad once we moved into the real estate business," explains Tsedeke Yihune, owner of Flintstone Engineering, one of the largest construction companies in Ethiopia. The increasing number of emerging middle incomers has, on the other hand, increased the demand for real estate development. A 2010 study by the Africa Development Bank (AfDB) shows that Africa's middle class has increased to 34%, an increase of 27% from the 1980s. 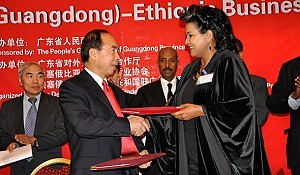 Ethiopia is not considered to be an exception even though the figure varies from one country to another. According to a recent survey conducted by the Paris-based consulting firm Sagaci Research, which considered about 1,000 households in Addis Ababa, the middle income households in the city reached more than 20%. 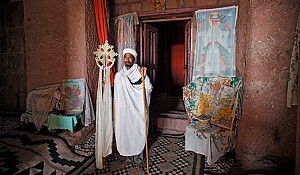 Though there is no concrete data available, the population of Addis Ababa is thought to be more than 6 million. 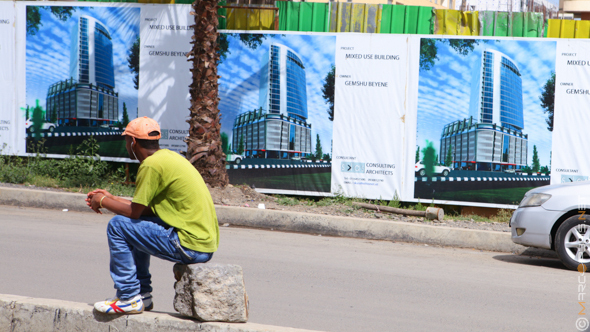 Given that the government cannot address the need for the increasing demand for real estate on its own, it allowed a number of local private investors to become the major actors in the development of real estate in Ethiopia. 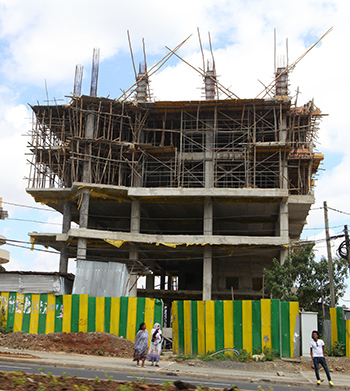 To this effect, 215 investors have received business licenses to develop the real estate sector in Ethiopia according to the data available at the country’s trade ministry. "There are now 50 of them operating in the market and competing with each other," notes Gebreyesus Igata, owner and general manager of GIFT Real Estate – a local real estate company which has been now operating for a decade. The success of those operating was looming; "We have concentrated on high labor productivity and quality workmanship and have survived for 22 years. Our revenue over the last five years has increased sevenfold," reveals Yihune from Flintstone Engineering. Within the last five years, about 5.4 million square kilometers of plots of land have been transferred to real estate developers in the capital city alone. In the 2013/14 fiscal year the government has planned to facilitate plots of land which can be used to build more than 1,000 apartments in the capital alone. “There is one thing we cannot deny: the demand is very huge,” says Igata from GIFT Real Estate. Yet, it is hard to say that the demand is addressed. “There is one thing we cannot deny: the demand is very huge,” says Igata from GIFT Real Estate. Due to the high demand and the incentive which the government provides for real estate developers, the real estate sub-sector has been witnessing a 22% growth since 2004 in terms of the number of real estate developing companies according to the available research figures. The capital city, for instance, has seen construction of villas, largely one-storey and three bed-room types, reaching close to 15,000 units over the past decade and a half. As a sub-sector, coupled with the construction sector, real estate contributes about 15% of the overall GDP of the country. In this regard, real estate takes the lion’s share - about 60% within the 15% contribution. This sector (the real estate) has grown by a total of 25% in the last few years when compared to the overall GDP growth of 10%. This is not, however, without a challenge. The sector has been the one in dispute particularly when it comes to delivery. The majority of the developers who had received plots failed to deliver timely as they had agreed with their clients. Even though 206 investors were issued licenses to develop real estates, only 15 of them have completed the houses and transferred houses to the hands of their clients. Four of them were kicked out while the rest are still with incomplete houses for up to ten years. Some of them are also currently ordered by the Federal High Court to transfer their unfinished houses with compensating their clients. Such inconveniences emanate mainly from two major problems. The fact that many of the real estate developers are formed as share companies is the first one. The real estate sector is among the sectors in Ethiopia that have seen an unprecedented growth in the number of share companies under formation through the initial public offer of shares. Although share companies in the country has manage to mobilize large amounts of capital from the public, the failure of most of the share companies in the portfolio of share companies have brought disappointments to many of the shareholders so that mobilizing the necessary capital becomes impossible. This, on the other hand, leads the companies to a failure to deliver the houses as they have promised. The other major reason that has been hindering development of the sector is the absence of a modality that can govern actors in the sector. In this regard, the trend of real estate development in the country has been inconsistent and lacking uniformity. Even though a number of investors including celebrities such as Aster Aweke, a prominent singer, and Haile G. Silassie, a prominent athlete, have taken large plots; they either left the plots idle or used it for purposes other than real estate development. The city administration has revoked licenses of many as a result. But the sector is still highly prone to corruption-related doings. As a result of this, many property buyers do not have the trust of the real estate developers. "People have to pay for houses from their savings. It is very necessary that the income of the general population increases while their consumption or expenditure is maintained at the same level or the trajectories of the income and the expenditures are divergent in a positive way. … Any kind of real estate ideas that we might come up with can only be sold to the public at large if we work on increasing the average income of the population." By and large, the sector is getting different alternatives to grow in a better rate within few years. As the proclamation that states the proportion of space for green areas and roads in lands allotted for real estates will be a minimum of 20% of the size of the land permitted for development, and of course as the issue of delivery which has been quixotic addressed (be it through the involvement of foreign competition or new coming local real estates), the sector is ready to replace the image of slum areas in ‘the chocolate city’ with mini-palaces as witnessed in some selected villages in the capital such as Lebu, CMC and Bole.